(with Edward McCaffery) “Expanding Discrimination Research: Beyond Ethnicity and to the Web.” Social Science Quarterly, 85 (September 2004): 713-30. “Islamic Barriers to Ottoman Economic Modernization: The Case of Insurance Markets” (September 2004). “Why the Middle East Is Economically Underdeveloped: Historical Mechanisms of Institutional Stagnation.” Journal of Economic Perspectives, 18 (Summer 2004): 71-90. Reprint: The Development Economics Reader, ed. Giorgio Secondi (London: Routledge, 2008), pp. 107-25. Chinese translation: “Zhong Dong Di Qu He Yi Jing Ji Luo Hou: Jing Ji Ting Zhi De Li Shi Ji Li.” Kai Fang Shi Dai (Open Times), 183 (March 2006): 89-105. Arabic translation: “Asbāb Takhalluf al-Sharq al-Awsat Iqtisadiyyan Al-Āliyyat al-Tārikhiyyah lil-Rukūd al-Mu‘assasatiy.”http://www.misbahalhurriyya.org, April 2006. Italian translation: “Perché il Medio Oriente è Economicamente Arretrato: Meccanismi Storici di Stagnazione Istituzionale.” QA: Rivista dell’ Associazione Manlio Rossi-Doria, 2005: 45-73. “The Economic Ascent of the Middle East’s Religious Minorities: The Role of Islamic Legal Pluralism.” Journal of Legal Studies, 33 (June 2004): 475-515. “Riba,” Encyclopedia of Islam and the Muslim World, vol. 2 (New York: Macmillan Reference, 2004): 596-97. “Property,” Encyclopedia of Islam and the Muslim World, vol. 2 (New York: Macmillan Reference, 2004): 553-54. “Capitalism,” Encyclopedia of Islam and the Muslim World, vol. 1 (New York: Macmillan Reference, 2004): 126-28. Excerpt from Islam and Mammon: Milken Institute Review, 6:3 (2004): 61-81. “Cultural Obstacles to Economic Development: Often Overstated, Usually Transitory,” in Culture and Public Action, ed. Vijayendra Rao and Michael Walton (Stanford: Stanford University Press, 2004), pp. 115-37. “Islamic Statecraft and the Middle East’s Delayed Modernization,” in Political Competition, Innovation and Growth in the History of Asian Civilizations, ed. Peter Bernholz and Roland Vaubel (Cheltenham, U.K.: Edward Elgar, 2004), pp. 150-83. 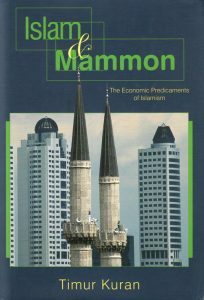 Islam and Mammon: The Economic Predicaments of Islamism (Princeton: Princeton University Press, 2004), xviii + 194 pp. Arabic translation: Al-Islam wal-Thara’al-Fahish: Ma’zaq al-Iqtisad al-Islami (Amman: al-Ahliyya, 2012). South Asian edition (New Delhi: Tulika Press, 2006). Turkish translation: İslâm’ın Ekonomik Yüzleri, by Yasemin Tezgiden, with an original introduction (Istanbul: İletişim, 2002), 303 pp. “Islamic Redistribution Through Zakat: Historical Record and Modern Realities,” in Poverty and Charity in Middle Eastern Contexts, ed. Michael Bonner, Mine Ener, and Amy Singer (Albany: State University of New York Press, 2003), pp. 275-93. Reprint in Historical methods in the Social Sciences, ed. John Hall and Joseph Bryant (New York: Sage, 2005), pp. 45-82. “Levant: Islamic Rule,” Oxford Encyclopedia of Economic History, vol. 3 (New York: Oxford University Press, 2003): 309-14. “Opportunistic Taxation in Middle Eastern History: Islamic Influences on the Evolution of Private Property Rights” (August 2002).